A fusion of crisp, architectural styling and practical attributes, K7 will appeal to culinary experts who settle for nothing less than the best. Featuring GROHE SilkMove technology – gives precise control of the water flow and temperature. For added convenience, this model has an independent hand-held pull-out spray. Mounted beside the kitchen tap, the side spray is your optimal kitchen helper, offering maximum flexibility for your kitchen work. With its powerful shower jet, you can easily rinse pots or clean the entire sink and work area. As for the sink, The Wave has an elegant design that emphasises its squared bowl and flat drainer. The stainless steel is easy to clean whilst maintaining its bright finish. It includes a preventative overflow function that effectively acts as a safety solution. 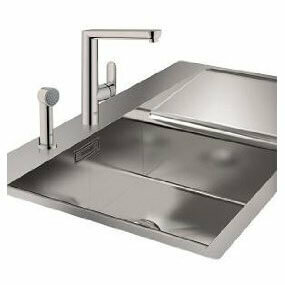 The sink is available in both right and left hand orientation to suit your kitchen needs.